Tables, with fixed or adjustable height, designed for lumbar and / or cervical tractions, or other physical therapy treatments, for stretching muscles, and other therapies. This equipment can be used to perform lumbar and cervical tractions. Tractions can be applied in a “static”, “dynamic” or “intermittent dynamic” mode. Bags with differents weights, cushions for patient positioning during traction, various straps in different sizes to provide additional aid with lumbar and cervical traction. Cervical traction in sitting position. Different tools for muscle relaxation and relief, effective aids for mobilization and in antalgic, preventive and rehabilitative exercise. Articles that can be used by the user/patient independently (no external help/carer needed). Ideal for home treatment programs. The Active Lumbar Traction (ALT) is originates from the swedish method of auto-traction, a mechanical type of treatment for lumbosciatic pain due to benign mechanical compression causes. Among the mechanical causes we can include radicular syndromes due to protruded or herniated discs, as well as the insidious spinal stenosis syndromes. 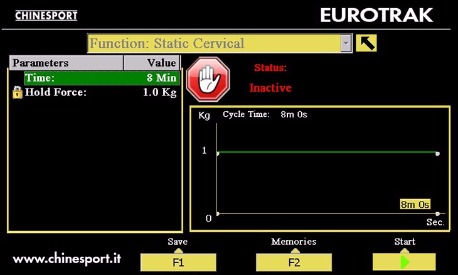 Another facilitation for the traction therapy is the "EUROTRAK", an electronic equipment programmed to perform lumbar or cervical therapeutic tractions, in static, continuous or intermittent modes. BACK SCHOOL suggests the use of supports to maintain the physiological curves not only during the daily activities but also during the exercises on the mat and the relaxation session. 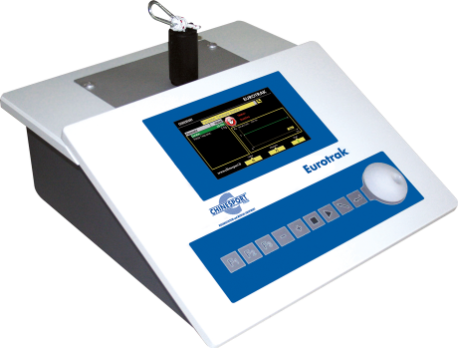 The EUROTRAK TOUCH electronic traction unit is designed to be used with a specific therapy table made by Chinesport or another manufacturer. In any case the traction unit needs and additional, purpose-built support frame, and we can provide technical drawing for the supporting metal plate. We propose two optional therapy tables to be combined with our electronic traction unit: the model called ALFATRAC is at fixed height, the alternative BETATRAC is with a frame height adjustment. Eurotrak touch fitted to Betatrac table, with height adjustment. Eurotrak touch fitted to Alfatrac table, with fixed height. In static mode the unit exerts a steady force, equal to the set value, throughout the treatment. In dynamic mode there are four phases as shown in the diagram while the table gives the parameters for each phase. 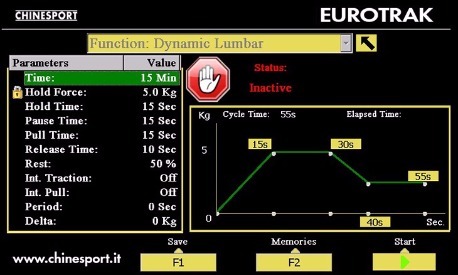 In dynamic mode, you can set the parameters related to the intermittent operation in the screen that appears when pressing the NEXT key. You can enable or disable the intermittent operating mode for each phase (the reference phases are those described in the previous paragraph). An instance of the intermittent operation is described in the diagram, with reference to the traction phase.